Putting themselves out there or just a little weird? Buskers, Street performers, Artists on the street, moving statues and sometimes kinda creepy. For a start you gotta admire someone for putting themselves out there. To earn a crust, for some there is the added bonus of gaining experience performing for an audience. Some are out there almost every day, others occasionally through out the summer. 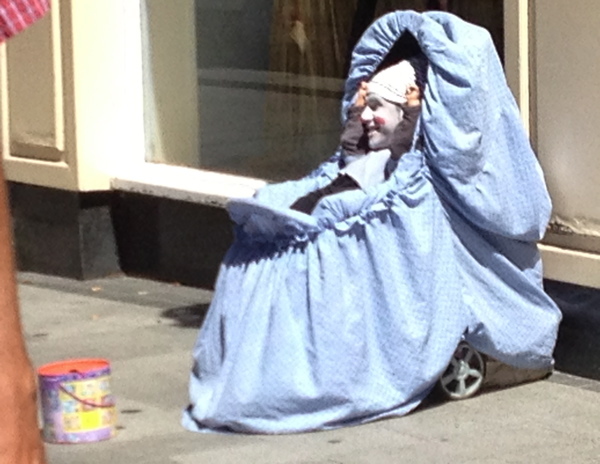 Any sunny Saturday performers can be found along Wexfords main street. Who’s the baba? This one was actually funny. I’d be inclined to think most uncomfortable for the performer to-boot. This one changes colour with the retail seasons. I have tried more than once to get a focused photo of this guy. The color of this ones face changes. All white, Black & White.